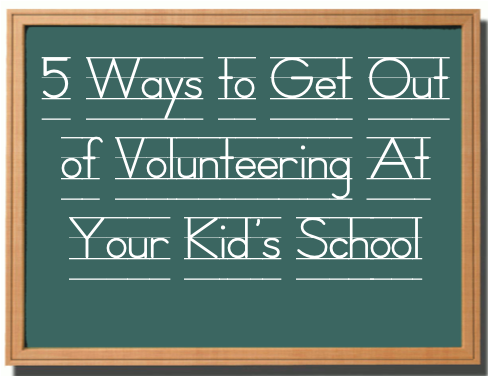 It starts in late summer with emails from the PTO alerting you to various “fulfilling” volunteer opportunities awaiting you at your kid’s school. On the first day of your school your child’s backpack is stuffed with sheets of colorful copy paper – each one proselytizing a “fun” volunteer gig. By the second week of school you’re being solicited as you wait in your car in the after school pick up line. Week three of the new school year the gloves are off and you feel a little like you’re being bullied into chairing the school spirit wear sale. When week four hits you give in from equal parts sheer exhaustion and because you get the feeling some of the other moms are talking about you and not in a good way. Now, before you tape this list to your refrigerator please be advised that I have loved volunteering at my children’s schools. In fact, I have met my best mom friends from doing my volunteer due diligence. But there are times in one’s life when you need a pass from tallying up the school gift wrap orders which is why this handy list was created. 1) Have another baby. A newborn will get out of any volunteer duty. Just showing up at school with your bundle of joy is akin to wearing a sign that says “Leave Me the Hell Alone!” But beware by the time that baby celebrates it’s second birthday you will be considered back on the market and hit up with a vengeance. After all, you’ve had a “two year break”. 3) Start a New Job. Tread carefully when using this one and make sure the words part-time job don’t enter into your career description. Which means even if it is part-time or a home based business as far as anyone on any committee at your kid’s school is concerned you’re putting in 40 plus hours a week. But be warned this is not a “forever” excuse. It’s simply a single “get out of being a committee chair” voucher. The whole job thing in the school volunteer lexicon is meaningless because there’s always a mom who is a cardiovascular surgeon and is piloting her own jet to Syria two days a week to perform life saving medical treatment with the International Committee of the Red Cross AND is treasurer of the PTO. 4) Get New Agey. Share that you are restructuring your life and prioritizing your family’s goals to enhance pivotal bonding moments and increase your spiritual connection to the Sun Goddess Shemesh therefore leaving you with zero time for “other world” commitments. Sure, there will be talk that you’ve booked first class passage on the Space Shuttle Cra Cra with non stop service to WTF but I can guarantee not only will you be left alone but people will be wary of making eye contact with you. 5) Volunteer for the Big One. By this I mean agree to chair your school’s biggest fundraiser. Oh, I know it sounds counter intuitive, but trust me one big volunteer commitment is your get out of jail free card for YEARS. Here’s how I suggest playing this for optimum long-term impact. When your eldest child is in third grade bite the bullet and say an enthusiastic yes to the fundraiser. While chairing the fundraiser let it be known about all the hard work you’re putting in, the hours it’s stealing away from your precious family, and for extra measure I always like to throw in that it’s causing just the tiniest bit of marital discord. All of this is excellent info to share at any PTO meeting when you’re asked to do an update. After the fundraiser is done and has exceeded expectations, because who are we kidding you were in charge and of course that means fundraising records were set, you then ride off into the school volunteer sunset. What all this means is for the rest of your tenure as a parent with school aged children you can use the excuse that you Chaired the (insert name of fundraiser here) back in (insert year here) and you really are still recovering. No one will dare challenge that statement and instead will look at you with awe and in some cases eyes aglow with reverence and thank you for your service. Sure, it’s was months of hard work, but if you do the math and extrapolate that over the years your kids are in school you’ll find that it’s a cost benefit analysis winner! Ha! I just had TWO babies. When the teachers hand me all the forms for the start of the new school year, they look through and pull out the volunteer form and say “Well, you won’t have time for that form for a couple of years at least huh?” It is a bit of an extreme way to get out of volunteering but I’ll take it! This is why the same people have to do all the work all the time. Right? Maybe if everyone pitched in a LITTLE BIT, the rest of us wouldn’t have to do a million things on our own. I’m not a type A but I choose the things I know I’ll actually enjoy and put in my fair share of work. Why even volunteer? Does it really improve your child’s educational experience? NOT! Volunteering at the school is a way to create a country club atmosphere and create a hierarchy for social climbing. Better to spend free time teaching your kids how to be decent and act appropriately. The outcome is far more gratifying than a bake sale. Now that my kids are teens, they would rather die than see their mother at school during the day, so I’m done. Why volunteer? Sadly you are correct about the hierarchy for social climbing, something I never cared enough about. I never had a clue about how to boost my kids into the Popular Crowd. Truthfully I wanted to volunteer when my kids were little. For awhile, I foolishly tried my best. Gradually it dawned on me that I didn’t belong, due to my major difference in priorities: School volunteers love drama. I don’t. So it goes. I regularly contribute $$ to fundraising efforts and wish everyone the best. I’m self employed and work a lot of hours. Finding time to volunteer is not so easy. I went with #5 on your list and I chair book fair which is a week long commitment with a long lead time of prep work (luckily done all via email & phone at odd hours with a great co-chair). This gets me a pass on everything else. All I have to say is “Well, I’d love to help but chairing book fair is such a major commitment and I really want the school to be supported properly”. Done. Loved chairing the book fair! It’s my all time favorite volunteer job. If only I’d thought of that New Agey thing….. I had eight kids…they would have believed I’d flipped out!